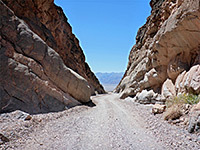 Titus Canyon is the largest of many ravines that cut through the Grapevine Mountains, on the east side of Death Valley, and unlike some of the others (such as Fall Canyon, Grey Wall Canyon and Red Wall Canyon), it contains no significant obstructions, allowing an unpaved road to follow nearly the full length; a one-way, 26 mile route starting in the east along Hwy 374 (in Nevada), rising gently to 5,250 foot Red Pass then descending along the canyon. 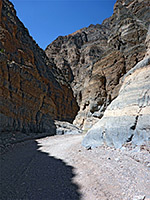 The narrowest, deepest and most spectacular part of the drainage is the lower two miles, and this is also suitable for hiking; starting at the mouth of the canyon, reachable by a less rough, two way track forking off the main park drive, 15 miles north of the Hwy 190 junction; the same track used for hikes to adjacent Fall Canyon. Traffic on the road is usually light, with maybe one vehicle every ten minutes at the busiest times, despite this being the most popular backcountry drive in the national park, so for most of the day the peace of the canyon is undisturbed. The floor is nearly all covered by large, often loose pebbles, with just a few patches of sand or bare rock, and although periodic floods can cause brief closures, for most of the year all is completely dry. High walls around the lower section create some shade, extending the hiking season, but the place is still not advisable for visits on foot during the hot summer months. 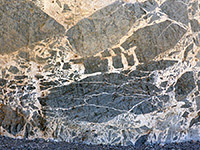 The enclosing rocks are limestone and dolomite (the Bonanza King Formation), in thick layers which are angled, folded and partly metamorphosed, and quite photogenic. 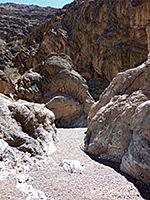 A few minor tributaries join, and at one point the canyon floor drops by around 20 feet in a series of low falls, bypassed by the road. 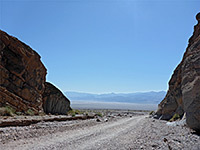 Another attraction is the plant life - the canyon is home to several rare species including Death Valley sage and rock lady (holmgrenanthe petrophila). 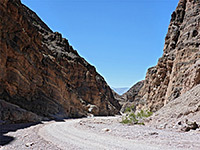 The name of the canyon refers to Edgar Titus, an engineer who died somewhere in the vicinity, in 1905. 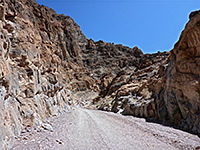 The gravel road to the parking area at the mouth of Titus Canyon is 2.7 miles long, climbing 800 feet, and is bumpy but not too difficult, suitable for most vehicles including small RVs. The slopes around the parking area are stony and barren though scattered flowers do grow here including desert five-spot. A 'No Entry' sign beside the continuation of the road marks the lower end of the one-way section. The canyon starts abruptly, as the cliffs right up, soon over one thousand feet above the floor. 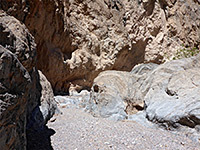 The lowest are light grey in color, worn smooth by the occasional water, while higher up the rocks are brown or dark grey, jagged and weathered. The most abundant large-flowered plants include Mojave aster and desert rock nettle, but the majority of the species are much smaller, growing in sheltered alcoves. 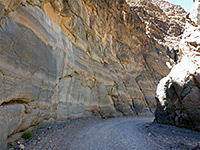 The first part of the canyon has a few tight bends, creating shadowy corners, then the drainage is straight for a while and more open, up to another narrow part, notable for intricate, marbled, grey and white patterns on the walls - dark breccia and whitish calcite. 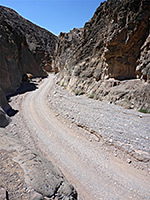 This is followed by a longer straight, leading to some more bends and then the rocky section where the road climbs a small hill on the right side to avoid the dryfalls. 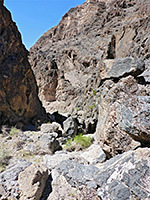 Just beyond is a narrow tributary, also on the right side, soon leading to a chute and unclimbable fall, this approximately at the end of the most enclosed part of the canyon, and so a suitable endpoint for the hike. Ahead the gorge is wider, enclosed by noticeably less steep slopes for half a mile, before a second confined section, similar to though less dramatic than the first.